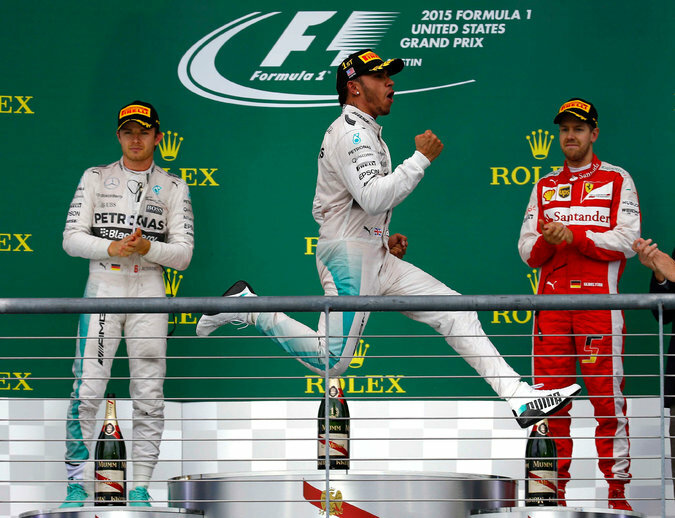 An elated Lewis Hamilton leaps on the victory podium after he won the U.S. Grand Prix in October and clinched his second straight world title and third overall. While almost every Formula One season begins with an idea about which teams are likely to win the championship, the 2015 title race was already a foregone conclusion by the end of last year. It seemed that only in the details could an unexpected narrative unfold. Fortunately, the details proved to be so intricate and surprising that despite it being another year of Mercedes dominance, the soap opera that inevitably takes place up and down the grid was entertaining from beginning to end. From the outset, the biggest uncertainty concerned how teams would fare with technical regulations that limited the engine manufacturers’ ability to develop their engines once the season began.